the island of New Guinea, which consist of the Indonesian provinces of Papua and Papua Barat (formerly West Irian Jaya) and the independent country of Papua New Guinea. The term was coined by Charles de Brosses in Histoire des navigations aux terres australes (1756). He derived it from the Latin for "south of Asia" and differentiated the area from Polynesia (to the east) and the southeast Pacific (Magellanica). It is also distinct from Micronesia (to the northeast). Although de Brosses grouped the region together using a singular term, the isolation of the main areas has resulted in several separate and unique islands or areas within the region he called Australasia. 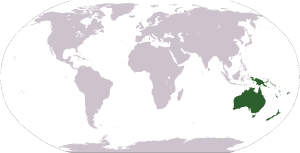 Physiographically, Australasia includes the Australian landmass (including Tasmania), New Zealand, and New Guinea. The independent country of Papua New Guinea also includes approximately 600 offshore islands. The name "Australia" is derived from the Latin Australis, meaning "of the South." Most of Australia lies on the southern portion of the Indo-Australian Plate, flanked by the Indian Ocean to the west and the Southern Ocean to the south. Peripheral territories lie on the Eurasian Plate to the northwest, the Philippine Plate to the north, and in the Pacific Ocean – including numerous marginal seas – atop the Pacific Plate to the north and east. 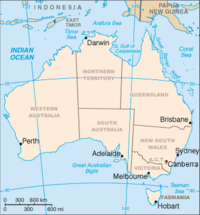 Australia has a total landmass of 3,074,740 square mile (7,686,850 square kilometer) on the Indo-Australian Plate, slightly smaller than the contiguous 48 states of the United States, and 15,970 miles (25,760 kilometers) of coastline. Tectonic uplift of mountain ranges or clashes between tectonic plates occurred in Australia's early history, when it was still a part of Gondwana. Much of Australia is desert or semi-arid. Only the southeast and southwest corners of the continent have a temperate climate and moderately fertile soil. As the majority of Australia is desert or semi-arid, erosion has heavily weathered its surface, resulting it one of the flattest countries in the world. Australia also has the oldest and least fertile soils, and is the driest inhabited continent. "Nueva Guinea" was the original name coined by the Spanish explorer Yñigo Ortiz de Retez in 1545. He noted the resemblance of the people to those he had seen earlier along the Guinean coast of Africa. The name was later anglicized to New Guinea. New Guinea's landmass is about 309,000 square miles (800,000 square km). The island of New Guinea is part of the Australian Plate, known as Sahul, and once formed part of the super-continent Gondwana. Sahul separated from Antarctica about 96 million years ago after Gondwana began to break up (approximately 140 million years ago). New Guinea moved into the tropics as it drifted north. The origin of most New Guinean and Australian fauna are closely linked. The name "New Zealand" originated from Dutch cartographers, who originally named the islands Nova Zeelandia, after the Dutch province of Zeeland. James Cook, the British explorer, subsequently anglicized the name to New Zealand. New Zealand consists of two main islands, North Island and South Island, (Te-Ika-a-Maui and Te Wai Pounamu in Māori) and a number of smaller islands. The total landmass is 103,738 sq miles (268,680 square km), with approximately 9,404 miles (15,134 km) of coastline. The larger South Island is divided along its length by the Southern Alps, with Aoraki/Mount Cook at 12,320 ft (3754 meters) its highest peak. The North Island is less mountainous, but is marked by volcanism including the active Mount Ruapehu (2797 m / 9177 ft). New Zealand is part of the continent of Zealandia which is 93 percent submerged and approximately half the size of Australia. Approximately 25 million years ago, a shift in plate tectonic movements pulled Zealandia apart. Geopolitically, Australasia is most often used as a term for Australia and New Zealand together, in the absence of another word limited to those two countries. There are many organizations whose names are prefixed with "(Royal) Australasian Society" that are limited to just Australia and New Zealand. In the past, Australasia has been used as a name for combined Australia/New Zealand sporting teams. Examples include tennis between 1905 and 1913, when Australia and New Zealand combined its best players to compete in the Davis Cup international tournament (and won it in 1907, 1908, 1909 and 1911). Australasia also competed at the Summer Olympic Games of 1908, where they earned 1x GOLD (Rugby Union), 2 x SILVER and 2 x BRONZE medals, and again at the 1912 Summer Olympic Games, where they earned 2 x GOLD (both swimming), 3 x SILVER and 3 x BRONZE medals. Anthropologists, although disagreeing on details, generally support theories that call for a Southeastern Asian origin of indigenous island peoples in Australasia and neighboring subregions. The first human habitation of Australia is estimated to have occurred between 42,000 and 48,000 years ago. These first Australians were the current Indigenous Australians' (Aborigines) ancestors. They were mostly hunter-gatherers and arrived via land bridges and short sea-crossings from present-day Southeast Asia. 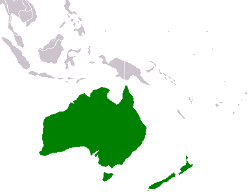 The Australasian ecozone is an ecological region that is coincident, but not synonymous (by some definitions), with the geographic region of Australasia. The ecozone includes Australia, the island of New Guinea (including Papua New Guinea and the Indonesian province of Papua), and the eastern part of the Indonesian archipelago, including the island of Sulawesi, the Moluccan islands (the Indonesian provinces of Maluku and North Maluku) and islands of Lombok, Sumbawa, Sumba, Flores, and Timor, often known as the Lesser Sundas. The Australasian ecozone also includes several Pacific island groups, including the Bismarck Archipelago, Vanuatu, the Solomon Islands, and New Caledonia. New Zealand and its surrounding islands are a distinctive sub-region of the Australasian ecozone. The rest of Indonesia is part of the Indomalayan ecozone. From a biological point of view, Australasia is a distinct region with a common evolutionary history and a great many unique plants and animals, some of them common to the entire area, others specific to particular parts but sharing a common ancestry. The long isolation of Australasia from other continents allowed it to evolve relatively independently, which makes it home to many unique families of plants and animals. Australia and New Guinea are distinguished by their marsupial mammals, including kangaroos, possums, and wombats. The last remaining monotreme mammals, the echidnas and the platypus, are endemic to Australasia. Prior to the arrival of humans about 50,000 years ago, only about one-third of Australasian mammal species were placental. The boundary between Australasia and Indomalaya follows the Wallace Line, named after the naturalist Alfred Russel Wallace who noted the differences in mammal and bird fauna between the islands either side of the line. The Islands to the west of the line, including Java, Bali, Borneo, and the Philippines share a similar fauna with East Asia, including tigers, rhinoceros, and apes. During the ice ages, sea levels were lower, exposing the continental shelf that links these islands to one another and to Asia, and allowed Asian land animals to inhabit these islands. Similarly, Australia and New Guinea are linked by a shallow continental shelf, and were linked by a land bridge during the ice ages. A group of Australasian islands east of the Wallace Line, including Sulawesi, Halmahera, Lombok, Flores, Sumba, Sumbawa, and Timor, is separated by deep water from both the southeast Asian continental shelf and the Australia-New Guinea continental shelf. These islands are called Wallacea, and contain relatively few Australian or Asian mammals. While most land mammals found it difficult to cross the Wallace Line, many plant, bird, and reptile species were better able to make the crossing. Australia, New Zealand, and New Caledonia are all portions of the ancient supercontinent of Gondwana, which started to break into smaller continents in the Cretaceous era, 130-65 million years ago. New Zealand broke away first, more than 80 million years ago, and Australia finally broke free from Antarctica about 45 million years ago. All the Australasian lands are home to the Antarctic flora, descended from the flora of southern Gondwana, including the coniferous podocarps and Araucaria pines, and the broadleafed southern beech (Nothofagus), and proteas (Proteaceae). As Australia moved north into the desert latitudes, the continent became hotter and drier, and the soils poorer and leached of nutrients, causing the old Antarctic flora to retreat to the humid corners of the continent in favor of new drought and fire tolerant flora, dominated by the Eucalyptus, Casuarina, and Acacia trees, and by grasses and scrub where the rainfall was too scarce to support trees. Presently Australia is the smallest continent, and also the driest continent and the flattest (lowest in elevation) continent. The present distribution of Australasian plants and animals is partially a result of the geologic history of its land masses. Several of the land masses in the ecoregion are fragments of the ancient continent of Gondwana, while a number of smaller islands are of more recent volcanic or tectonic origin, and were never part of Gondwana. New Guinea, Australia, and Tasmania, collectively known as Australia-New Guinea, Sahul, or Meganesia, are connected by a shallow continental shelf, and together form the largest fragment of Gondwana. The shallow continental shelf that presently separates the islands has served as a land bridge when sea levels were lower, most recently during the last ice age. New Guinea shares many families of birds and marsupial mammals with Australia. As the Indo-Australian Plate, which contains India, Australia, and the Indian Ocean floor in between, moved north, it collided with the Eurasian Plate, and the collision of the two plates pushed up the Himalayas, the Indonesian islands, and New Guinea's Central Range. The Central Range is much younger and higher than the mountains of Australia, so high that it is home to rare equatorial glaciers. New Guinea and Wallacea are part of the humid tropics, and many Indomalayan rainforest plants spread across the narrow straits from Asia, mixing together with the old Australian and Antarctic floras. Some botanists consider New Guinea and Wallacea to be part of the floristic province of Malesia, together with the other Indonesian islands and the Malay Peninsula, although Malesia is now mostly used to refer to only the Indomalayan side of the Wallace Line. New Zealand and New Caledonia are the other former fragments of Gondwana in the region. The island groups north and east of New Guinea and New Caledonia, including Bismarck Archipelago, Admiralty Islands, Solomon Islands and Vanuatu, were pushed up by the collision of the Australian plate with other oceanic plates. These islands, collectively known as the East Melanesian Islands, were colonized by plants and some animals from New Guinea and New Caledonia, and are considered part of the Australasian ecozone based on those affinities. Further north and east are the Pacific island groups of Micronesia, Fiji, and Polynesia, which are also of relatively recent volcanic origin, and constitute the separate Oceania ecozone, although they share many ecological affinities with Australasia. Bats were the only mammals of New Zealand until the arrival of humans. Birds adapted to ecological niches, such as grazers, insectivores, and large predators that have elsewhere been taken by mammals. New Zealand remained in the cool and humid latitudes, and lost many plant and animal families that were intolerant of its cool climate, including the araucarias and most proteas, as well as crocodiles and turtles. Large reptiles, including crocodiles and huge monitor lizards (family Varanidae), like the Komodo Dragon (Varanus komodoensis), are ecologically important predators in Australia, New Guinea, and Wallacea. There are 13 endemic bird families, including emus, cassowaries, kiwi, kagu, cockatoos, birds of paradise, and honeyeaters. The arrival of humans to Australia and New Guinea 50-60,000 years ago brought dogs (dingos) to Australia, and dogs and pigs to New Guinea. Pigs and rats arrived on New Zealand with the first Polynesian settlers 800 years ago. The arrival of the first humans coincided with the extinction of much of the native megafauna (Holocene extinction event). The arrival of Europeans brought a whole host of new animals and plants, including sheep, goats, rabbits and foxes, to Australasia, which have further disrupted the native ecologies; a great many Australasian plants and animals are presently endangered. Most of Australasia has a prosperous, Western-style mixed economy, with relatively high per capita GDPs and substantial natural resources including bauxite, coal, iron ore, copper, tin, gold, silver, uranium, nickel, tungsten, mineral sands, lead, zinc, diamonds, natural gas, petroleum, timber, hydropower, and limestone. Although the other economies are flourishing, in March 2006 the United Nations Committee for Development Policy recommended that Papua New Guinea's designation of developing country to be downgraded to least-developed country because of protracted economic and social stagnation. The absence of export-oriented manufacturing industries throughout the area has been considered a key weakness of the Australasian economy; however rising prices for the regions commodity exports and increasing tourism have minimized the effect of this lack of export manufacturing. Large current account deficit, in relation to the GDP, are common throughout the area. The service sector of the economy, including tourism, education, and financial services, comprises 69 percent of GDP. Australasia is a region heavily dependent on trade, particularly in minerals and agricultural products with tourism also playing a significant role in the region's economy. Unlike most of the regions natural resources, access to Papua New Guinea's resources has been hampered by rugged terrain, the high cost of developing infrastructure and serious law and order problems. The total population of Australasia was estimated at approximately 33 million in mid-2007 with Australia accounting for just under 20.5 million. Major ethnic groups include Caucasian, Asian, Maori, Aborigine, Pacific Islander, Melanesian, Papuan, Negrito, Micronesian, Polynesian and Indonesian. Life expectancy at birth ranges from 65.6 years in New Guinea to 80.6 years in Australia. Literacy at 15 years of age ranges from 99 percent in Australia and New Zealand to 57.3 percent in Papua New Guinea with Western New Guineas literacy rate at 90.4 percent. The major language of Australasia is English, spoken by over 20 million Australasian inhabitants, however, other major languages include Maori, Melanesian Pigin, Bahasa Indonesia, and many local dialects. Inhabitants of New Guinea alone speak over 820 different languages accounting for over ten percent of the worlds languages. In addition to English and Maori, Sign Language is one of New Zealand's official languages. Major religious beliefs in Australasia include Catholicism, Anglican, other Christian, Buddhist, Muslim, Hindu, and local indigenous beliefs. As with most things in Australasia, there are many different cultures common, and often unique, to the region. These vary from the Anglo-Celtic influenced culture that has freely evolved with distinctly Australian and New Zealand features to the West Papuan culture that has been forcibly repressed under the forty years of Indonesian rule since 1963. While Australian culture has a long history of visual arts, beginning with the cave and bark paintings of its indigenous peoples, the New Zealand and New Guinea cultures have undergone distinct changes since the arrival of Europeans; and in particular the introduction of Christianity in the early 19th century. Each region still has an indigenous culture that influences everyday life in the particular country. Australia has the Aboriginal culture that largely transmits their traditions orally and their traditions are closely tied to ceremony and the telling of the stories of the Dreamtime. The Dreaming signifies both the ancient time of creation and the present day reality of Dreaming. There are many different groups, each with their own individual culture, belief structure, and language. These cultures have overlapped and evolved over time. The Rainbow Serpent is a major Ancestral being for many Australian Aboriginal people, whereas Baiame or Bunjil are regarded as the primary creator-spirits in Southeast Australia. Dingo Dreaming is a significant Ancestor in the interior regions of Australia. The Yowie and Bunyip are also well known ancestral beings. Australian Aboriginal music, dance, and art continue to have an influence on contemporary Australian visual and performing arts. A common theme in Australian art has been the Australian landscape, as evidenced by the works of Arthur Streeton, Arthur Boyd, Albert Namatjira, Pro Hart and others. The haka is a traditional genre of Māori dance. 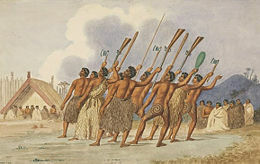 This depiction of a haka as a war dance dates from ca. 1845. In New Zealand’s Māori culture, the marae (a sacred place used for both religious and social purposes) continues to play an important role in communal and family life. As in traditional times, karakia (incantations and prayers) are habitually performed by Māori today to ensure the favorable outcome of important undertakings, but today the prayers used are generally Christian. Māori still value their connections to Polynesia, and regard their allegiance to tribal groups a vital part of personal identity. Māori kinship roles still resemble those of other Polynesian peoples. Recently, Māori culture has enjoyed a resurgence with the increasing popularity of the tradition-based arts of kapa haka (song and dance), carving and weaving, and the architecture of the marae maintains strong links to traditional forms. The Māori language (Te Reo Māori) previously was only used in a few remote areas, but is currently undergoing a renaissance, thanks in part to Māori language immersion schools and a Māori television channel. Despite the fact that te reo is an official language equal to English in New Zealand, this is the only nationwide television channel to have the majority of its prime-time content delivered in Māori. In Papua New Guinea the culture is multi-faceted and complex with in–excess of one thousand different cultural groups estimated to exist. This diversity results in many different styles of cultural expression, with different groups having created their own expressive forms in art, dance, weaponry, costume, singing, music, wood carving, architecture among some of the more prevalent. Most of these different cultural groups have their own language and the people typically live in villages that are heavily dependant on subsistence farming. To supplement their diets, some tribes hunt and collect wild plants and yams. Great honor and respect are bestowed on those who become skilled at hunting, farming and fishing. In some cultures, to get a bride, a groom must bring a certain number of golden-edged clam shells as a “bride price.”  In other cultures, the “bride price” can be paid in lengths of shell money, pigs, cassowaries or cash. Elsewhere, bride price is unknown and it is brides who must pay a dowry. Many of the highland tribes still engage in colorful local rituals that are called "sing sings" where they will decorate themselves with paint, feathers, pearls and animal skins to represent birds, trees or mountain spirits. ↑ R. Gillespie, "Dating the first Australians" Radiocarbon 44 (2002): 455–472. ↑ Martin Flanagan, The exile who fights for the rights of all Papuans The Age Company Ltd, February 27, 2003. Retrieved October 19, 2007. ↑ Trini G. Sualang, Papua culture is not at risk The Age Company Ltd, March 3, 2003. Retrieved October 19, 2007. ↑ Munya Andrews. The Seven Sisters of the Pleiades (Spinifex Press, 2005), 428. ↑ The Papua New Guinea Information Site. Papua New Guinea; Arts, Customs and Traditions Retrieved October 19, 2007. Encyclopædia Britannica Eleventh Edition. Australasia Retrieved October 19, 2007. Richards, Kel. Australasia ABC News Radio, 2006. Retrieved October 19, 2007. World Wiildlife Fund. Map of the Ecoregions Retrieved October 19, 2007. This page was last modified on 24 March 2016, at 16:52.